I've wanted a podfic of this for years. Thank you. Thanks to your podfic I now have to watch this show. Seeing how I'm adding this ship to my armada. Any variation of "thanks to your [X] I now have to watch this show" is some of the best feedback anyone creating anything fannish can receive :))) Thank you, and I hope you enjoy SGA! I personally never found the show to be top-tier television when taken as a whole, but the characters are so great that the packaged deal ends up being a really fun and endearing ride despite some shortcomings along the way. And Rodney and John tend to storm your ship armada and take the helm once they get on board ;) The dynamic between Ronon, Teyla, John and Rodney is just delightful 99% of the time, too. 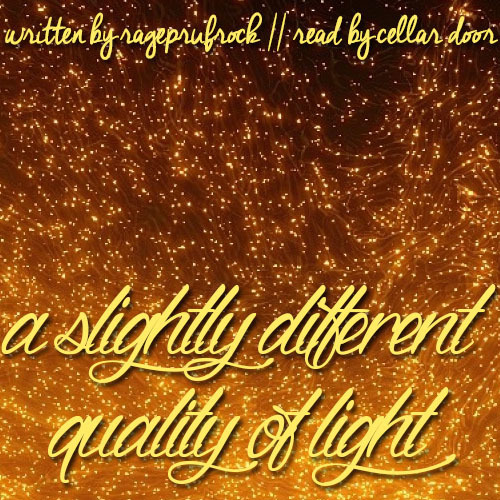 Oh oh one more thing: If you haven't yet, please consider giving Speranza's SGA fic a read as well, especially Written by the Victors (or the most excellent podfic of the same). Her characterization and storytelling is so good that at this point, what's canon and what's Speranza's canon are so intermixed in my head and heart that I can't have one without the other. OOOK now I'm done. Thanks again for commenting, and glad you liked the sound transitions, too; I love setting things to music and always hope it'll be subtle and not annoying!